When a customer comes to your dealership to explore purchasing an RV, they’re excited about the freedom that the road offers. Yet, despite the excitement, they often hesitate. They are fearful and uncertain about how to manage all that’s involved once they’ve purchased the RV. The #1 objection people have when they come to an RV dealership is their anxiety. They are concerned about how – if they buy – they’re going to make the transition into RV travel. We help dealerships overcome this objection from potential buyers. ==> We enable you to better help your customers make the transition easier and smarter. ==> You also get the opportunity to double your money! Ready to double your money while capitalizing on the growing trend of location-independent lifestyles? Nomadic Living 101, our comprehensive course, puts your customers on the fast-track to living this dream, their way, all while positioning YOU to capitalize on the growth of location-independent lifestyles. We’ve traveled the world and we now live full-time in an RV, touring the US, working from the road and exploring at our own pace. We’ve been seminar speakers at the Florida RV Supershow and have been featured in RV Pro Magazine, Mobile RVing, RV Open Road, RV Daily Report and other publications. 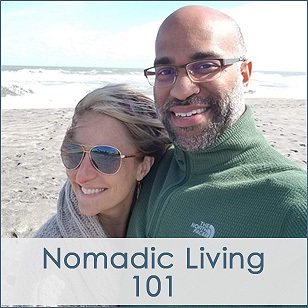 We created a very special course called Nomadic Living 101, especially designed to help people overcome all the obstacles and issues that might prevent them from buying and confidently making a seamless transition into an RV lifestyle. We now offer YOU – the RV dealership – the opportunity to provide Nomadic Living 101 to your customers by buying the program in bulk and re-selling it to your customers at whatever price point you want. You can even double it! 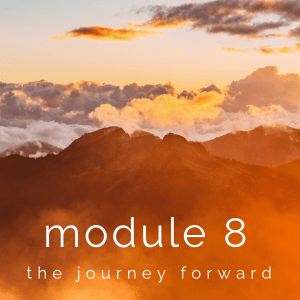 Nomadic Living 101 is a comprehensive, user-friendly, digital program, where we share real-life practical tips from our own experience to help others transition seamlessly into a nomadic lifestyle – be it for a month, a season, a year, or forever. We are also available to answer any additional questions about nomadic living – so rather than contact you, they’ll contact us. Our course is designed to serve: the new RVer, digital nomad millennials, and all-ages of those who aspire for seasonal or full-time RVing. We are presenting a way forward. Join forces with us, profit while serving this rapidly growing demographic*, and propel your dealership into the future. The next generation of RVers is beginning now, presenting YOU with the opportunity to build relationships with these customers now. We are actively living the RV lifestyle and teaching others how to make this dream real. Your customers will get a completely comprehensive program to help them ease into RVing, and YOU will make a ton of extra cash by helping your customers. Offering our modern, personal, user-friendly program will help you better serve prospective customers, current customers, new customers, your sales team, AND your bottom line! Given that young families, remote workers and millennials are getting into the RV lifestyle in record numbers, the dealerships best equipped to serve new RVers and ease them into the lifestyle are the ones who will capitalize most on this growing trend. These customers want more than a run-of-the-mill Starter Kit. Partner with us today to differentiate your store from other RV businesses and establish relationships that could result in 50 years of repeat customers! As an RV dealership, you can buy access to the Nomadic Living 101 program in bulk. Purchase packs of 10, 25, or 50 at a super discounted rate and resell it to your customers at whatever price you want. You can, in effect, double your money if you want to. When you purchase a pack of 10, 25, or 50, you will receive that many access codes to sell and share with your customers. 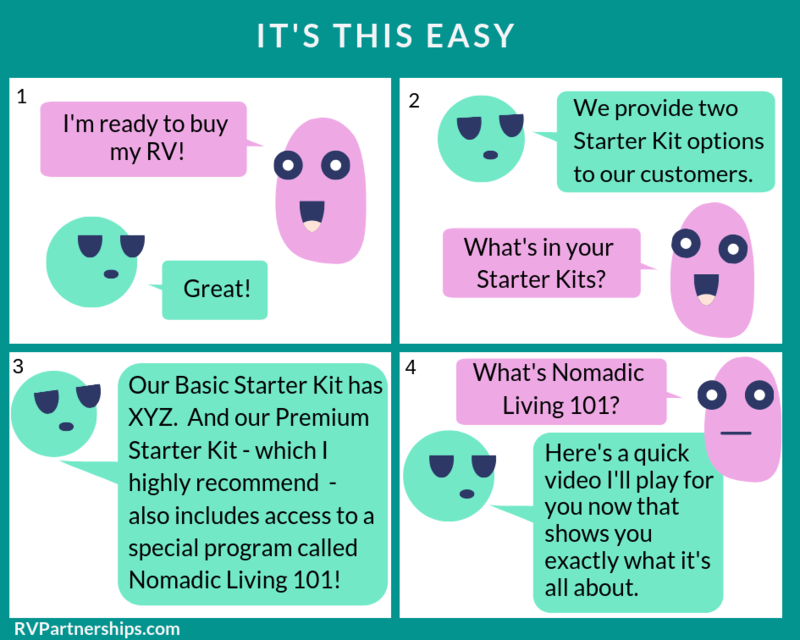 The Nomadic Living 101 program normally sells for $547. You can check out the details here. But – when you purchase in bulk for your customers, you buy at the discounted rate. Immediately after placing your order, you will receive an online confirmation and transaction receipt via email. 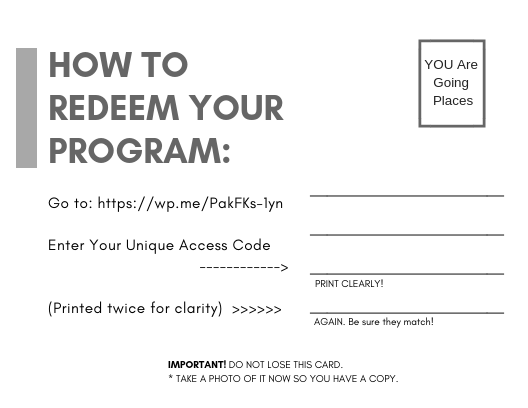 Within one business day, you will receive the Unique Access Codes you purchased, along with printable postcards. The postcards contain easy-to-follow consumer instructions and a space for one access code per postcard. The more you purchase, the greater your profit margin will be! You set the retail price. You charge your customer. We recommend charging twice what you pay, but you know your market best. Sell at the price YOU choose! Let’s say your company decides to sell the program to your customers for $300. Using the Best Value example above, your investment would result in $10,000 profit. $15,000 in sales ($300 x 50) – $5,000 investment ($100 x 50) = $10,000 ($200 x 50) profit margin! The sales process is easy. We provide everything you need to easily sell to your customer. 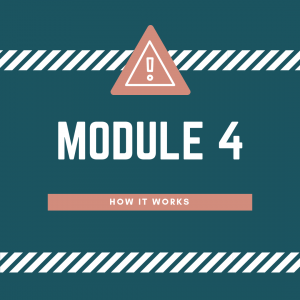 We provide you with a quick video for your sales person to play that easily shares and explains the value of adding Nomadic Living 101 to their purchase. Upon the sale, hand the customer their postcard and unique access code. The postcard has simple instructions for the customer to access the program and log in. The consumer will go to this webpage, and enter their access code. ==> Easily generate THOUSANDS while better serving your customers! ==> Determine your own retail price/profit margin, dividing commissions to your sales people however you choose! ==> Establish new relationships that could result in 50 years of repeat customers! And – there’s no rule that says you can’t sell, or gift, Nomadic Living 101 on it’s own! It’s a great option for curious prospective buyers to learn from. It prepares, and instructs, them to return to your dealership when they’re ready to buy! That’s it! Sell the program, set yourself apart from competitors, profit on every sale, better serve a growing market – all while positioning yourself to increase profits and gain repeat customers for years to come. Whenever you’re ready, simply re-order and we’ll send you another set of access codes to sell to your next group of customers. Easy-breezy. We look forward to the opportunity to work with you for a pleasant, easy, profitable partnership! PS – Your success is our success! It’s the very definition of a win-win. As strategic partners, our goal is to help make your sales process as seamless and successful as possible. 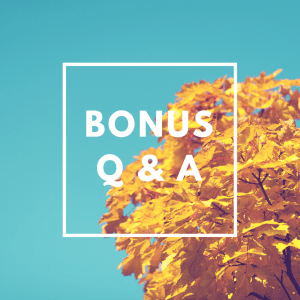 PPS – Have questions? Call (401) 569-7017 or send us an email at Tara@nomadicliving101.com. We are on the move a lot in our RV, so if you call and don’t reach us directly, please leave a voice mail. Click here to read RV PRO Magazine’s Feature Article about this unique industry opportunity. Nomadic Living 101: How to Live Nomadically – for a Month, a Season, a Year, or Forever. 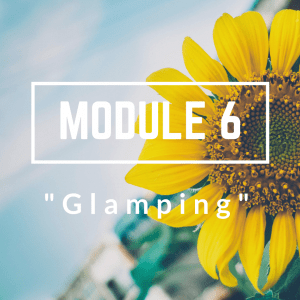 In this program, we pull back the curtain on EVERYTHING a new RVer could ever want to know about nomadic RV life. 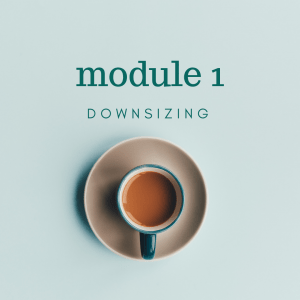 – The best approaches to downsizing, so you can hold on to your memories and still make new ones. – Storage, style, tricks and tips we’ve learned along the way that will save you oodles of time, frustration AND dollars! – How to decrease stress with less so you have more simplicity, fun, freedom and adventure. – How to finance nomad life with budget-friendly living that doesn’t sacrifice fun. – Getting boondock-ready, so you can self-sustainably be “off grid” and have plenty of cost-effective options independent of RV Parks. – Why you most definitely don’t need to win the lotto to live this lifestyle and a strategic 4-step money management process to chart the course for your journey. – Earth-friendly strategies that cut your costs and your carbon-footprint. 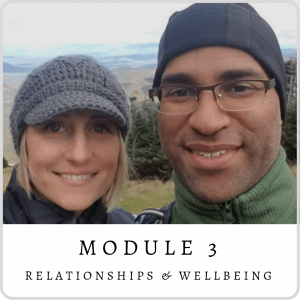 – Relationships on and off the road so you deepen the relationships you have and make meaningful new connections along your journey. – Self-care, food prep, and space management so you stay healthy, organized, and have everything you need to chef it up to the best of your gourmet abilities. – Fitness on the road so you look and feel your best, despite temptation to eat like you’re on vacation. – Traveling with pets and their care so it’s fun for everybody. – Location-independent logistics (banking, bill pay, getting mail, prescriptions, working from the road, etc…) so “adulting” happens without cramping your style. – Video demonstrations and a walk-through of how things work so you know exactly what you need to know. 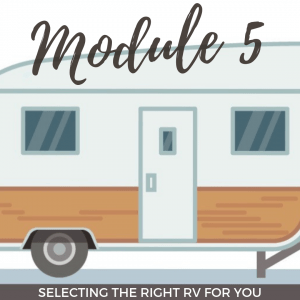 – Selecting the RV that’s right for you, so you have the amenities you need for comfort and the versatility you need for ease. – Personal safety and how to secure your stuff so you feel confident knowing you have minimized any risks. – A simple approach to minimize the stress and overwhelm of so many choices, options, and price points so you can focus in on your best-fit and get rolling. – “Glamping” and decor, so your ‘condo on wheels’ lifestyle reflects and supports your sense of style and taste. – 20 tips and space-saving products so you can be intentional about your space. 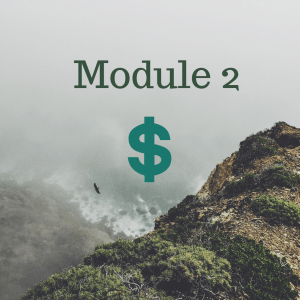 – Plus, 3 bonus nomad tips and an RV storage tip that will save you serious cash. – A proven process for managing your fear (a dream killer) and all the normal I’ve-never-done-this-before jitters so that they don’t undermine your dreams, your journey, or your life. 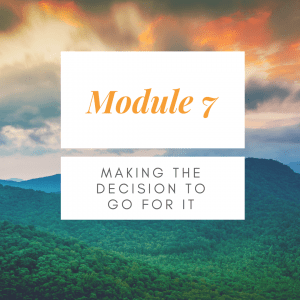 – Learn from Coach Tara as she shares from her behavior modification know-how, psychology training and experience so you can take on even your most daring goals and dreams, be the best version of yourself, and prevent fear from undermining your success. 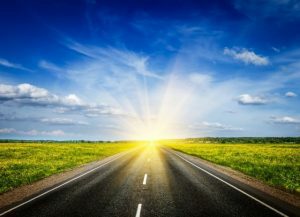 – Choosing and making arrangements for your journey, your way – so your journey is as unique as you are. – Where head meets heart and the rubber meets the road: how to put the practical pieces in place to support your desires so you chart your own course with intention, excitement and clarity. – Four items to consider replacing in your RV. – Tips for negotiating a price on an RV. – Eight creative ways to lighten your load. … and even the questions you didn’t know that you had! All of this, PLUS we provide you with downloadable worksheets and checklists, and connect you with our private support community via Facebook where you can ask any additional questions.